Here are 20 unique wedding ideas that will make your wedding more memorable, meaningful, and personalized. Enjoy! 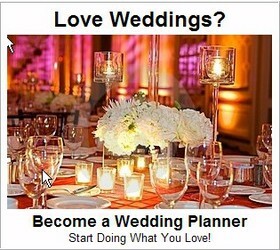 And if you have unique wedding ideas of your own, leave a comment and share your brilliance with our other readers! Consider having your rings engraved on the inside with your entire wedding vows, or another personalized message. It’s always been a lovely tradition for couples to have the inside of their wedding bands engraved, but until now, the message had to be extremely brief. In the past it was usually only possible to engrave initials or the wedding date into the rings. However, one clever and creative jewelry company has now developed a way to engrave your entire wedding vows inside your wedding rings. Their unique and patented process allows multiple rows of engraving, so entire wedding vows or other complete messages can be inserted. This has never been offered before, and is only available through the one company which holds the patent. We LOVE this idea – we only wish someone had figured out how to do this sooner! A wedding band is the most symbolic piece of bridal jewelry most people will wear. It represents the un-ending union of two people. It was originally believed that the ring finger has an artery that leads straight to the heart, and this is why the ring finger was selected for the important duty of wearing wedding rings. Once married, most people seldom take off their wedding rings, which also symbolize their faithfulness for each other. And the plain, traditional wedding band continues to be the most popular style because it captures the essence of love in its purest form. Look for jeweler engravers that have the ability to engrave a full message – or your full wedding vows – into your wedding bands, making them all the more meaningful and precious. Its a unique service that only some jewelers offer, and is a rather new idea, so you’ll need to hunt around. This gives a whole new meaning to the phrase, “It what’s inside that counts”! Looking for a unique alternative to “clinking glasses” at your wedding reception? Announce to your guests that in order for you to kiss, they must stand up and tell a story, or share a memory, about either you or your fiance, or about you as a couple. Then get ready to reminisce, to laugh, and to brush away tears. Your guests will be kept entertained and you’ll have so many more special memories of your big day to look back upon. Assign someone to snap pictures of guests as they arrive at the reception using an instant camera. After the wedding, sign each photo, add your wedding date, and include a short word of thanks to each guest for having attended. Mail the photos to the guests along with your thank-you cards as an extra special memento. Ask your floral designer to design two detachable floral sprays into your bouquet. After your father walks you down the aisle, just before he turns to leave you and take his seat, remove one of the special flowers from your bouquet. Hand it to him and give him a kiss. Let him know in advance that this will take place and tell him that as he takes his seat in the pew with your mother, he is to present the flower to her on your behalf. [See gorgeous wedding bouquets here]. Here’s a fabulous and wonderfully unique wedding favor idea! Searching for something a little more interesting than tulle-wrapped candy or useless little do-dads? Make it really special. Give your guests an elegant, but extraordinary gift they can grow. 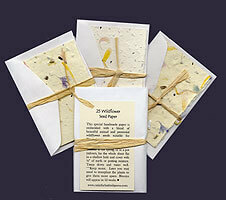 We found plantable seed cards of handmade paper which have flower seeds embedded right into the paper. Your guests can literally plant a memory of your wedding. Here’s how: Purchase a card for every guest, and include a handwritten note in each, thanking them for sharing your special day. This in itself is a very warm and personal way to show your appreciation to your guests for attending – but this little favor is a gift that keeps on giving! After the wedding, your guests will be able to plant the paper and watch it grow into real, living – and very lovely flowers. They simply “plant” the entire card into the earth, and soon it will begin to grow. Each card comes with planting instructions. The flowers it produces will be yet a second very special gift to them, from you, which will help them to remember your wedding. You will be in their thoughts often as they enjoy the prettiness of the flowers growing in their garden. Rest assured that they will tell every passing neighbor, and every visitor who stops to admire their garden, the story of how they grew flowers from the amazing little card of thanks given to them by you, on your wedding day. A very special remembrance of a very special day and couple. These handmade seed cards can also be used for extra-special wedding invitations, bridal shower invites, or thank-you cards. Did you know that if you are Catholic, you can have your marriage blessed by the Pope himself? You need simply send one of your wedding invitations to the Vatican for a blessing, along with a donation. You will then be sent a papal blessing which can be framed and treasured for a life time for it’s deep and special meaning. Ask your priest to provide you with information on precisely where and whom to address the invitation. Incorporate a piece of history and age old tradition into your wedding bouquet. Orange blossoms are one of the most highly traditional flowers which can be included in the bridal bouquet. Brides have being carrying this particular flower on their wedding day for centuries. In fact, it is perhaps the very first flower ever to be carried in a wedding bouquet, and one very rich in meaning and symbolism. What makes it so special? The orange tree was thought to be very significant because it is the only plant that bears both the flower and the fruit at the same time, a trait which symbolizes abundance. It was believed that by carrying blossoms from the orange tree in the wedding bouquet, the blessing of an abundance of all things beautiful and nurturing would be passed along to the new marriage. You can incorporate this special meaning into your own bouquet by having your florist include a few orange blossoms among the blooms you will carry on your wedding day, just as brides throughout the centuries have done. Create a montage of images to visually share your personal story with your guests. A perfect way to decorate your guest book table or other prominent location at the reception. Plan to greet guests with a table of sunny cocktails and a photo frame filled with fun images of the two of you growing together. One image can be replaced with a note directing guests to take a drink or an invitation to sign a the guest book. Fun,versatile and a memorable keepsake. Many brides or grooms struggle with the dilemma of what to get for the love of their life as a wedding gift. On this most important of all occasions, it has to be something extra special… and very romantic, but somehow the ideas just don’t seem to flow. We found a unique idea that we absolutely love – the perfect solution… For a very small fee you can have a star named after your sweetheart as a wedding gift to them. Yes, an actual star in the sky. Stars have been named after celebrities, dignitaries and other special people for years. Bet you didn’t know that you can do this for the person you love as a unique and utterly unforgettable gift. When you name a star for someone you love you also receive a parchment certificate, available framed or unframed, with the name of the person you are naming a star after, the dedication date, and telescopic coordinates of the star. You’ll be sent a booklet with charts of the constellations plus a larger, more detailed chart with the star you’ve named encircled in red so future generations may identify the star name in the directory and, using a telescope, locate the actual star in the sky! It really is the gift of a lifetime. What could be more perfect for the person who is the star in the story of your life? It’s an excellent idea as an anniversary gift for special people in your life as well. Here’s a wonderful idea for a beautiful and creative alternative to the standard guest book: Purchase a silver serving tray to be placed on a table by the door at your reception. As guests arrive, have them ‘sign’ the tray using an engraving pen or engraving tool. These engraving products can be purchased at most hardware stores, usually for about $15 – $24. In the end, you’ll have a precious and beautiful keepsake serving tray, covered in the signatures of your wedding guests. Display it in your china cabinet and pull it out for use on those extra special occasions. For simple but gorgeous centerpieces you can make yourself, try this idea! For every reception table you will have, purchase a silk floral garland. Lay the garland up the center of each table. Loosely swirl and twist satin ribbon around the garland. Add a few votive candles in votive cups and voila! Instant centerpiece and, oh, so easy! The perfect way to dress up long narrow tables affordably for an elegant, if not elaborate look! With these low lying centerpieces, you’ll never have to worry about guests having to crank their heads to see around obstructions! Note: This idea is intended when long rectangular banquet tables are used, as opposed to round ones. Have real, live butterflies or white doves released around you as you step out of the church, creating a true fairy tale effect. Your guests will never forget it! Neither will you. Check your local Yellow Pages for companies offering this service in your area. Attention to detail will make a definite impression among your guests – one not soon to be forgotten. Create an atmosphere of luxury for the ladies. Place vases of fresh flowers, or elegant dried flower arrangements, in the ladies room. Add fragrant bowls of potpourri, heart shaped soaps in decorative dishes, perhaps candles if the venue will permit (votives safely contained in glass votive holders). Include a lovely basket filled with items such as hairspray, a container of safety pins, tissues, hair pins, and a decorative dispenser containing hand cream, along with other such convenience items as a courtesy to your guests. Create unique and meaningful centerpieces for every table with a collection of pretty frames holding photos of you and your fiance. Include pictures from childhood through your courtship. Place them upon mirrors and surround them with votive candles, and rose petals or metallic confetti. If desired, go a little further and wind pieces of ivy garland between the frames. Voila! 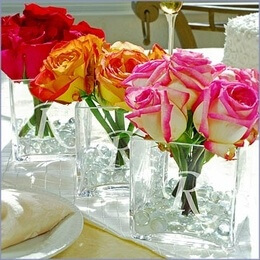 You will have simple-to-design, unique and meaningful centerpieces! You can later re-use the frames within your home or them away to special guests as gifts at the end of the evening. As an added benefit, all those photos will create interest and will serve as wonderful conversation pieces during the reception. Check out the fabulous selection of items you can use to create these centerpieces in our Online Wedding Store. Make it really special… Ask your mom, grandmother, or a special aunt to be your matron of honor. Who better to honor on the single most important day of your life? Touch her heart heart in a way she’ll cherish for ever! Make small corsages or boutonnieres for each wedding guest. Present each guest with a corsage or boutonniere as they arrive at the reception. (Have extras on hand in case of errors in calculating the number required of each!) What a wonderful way to honor your guests, make them feel special, and to express to them how much having them in attendance truly means to you! Personalization is what weddings are all about now. Couples are looking for ways to leave their own personal imprint on their wedding, to make it truly their own. Check out the engraved monogram on these personalized centerpiece vases, left. We love, love, LOVE this idea! Simply add a few stems of fresh roses or other favorite flower and you’ve got a signature centerpiece that oozes class and style. 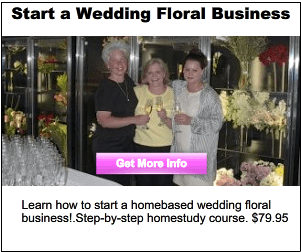 And its all do-it-yourself — no florist required, yet it’ll look like you hired a high end florist to put the look together. In the photo at left, water pearls have been added to the bottom of each vase for extra visual impact (you can also use mystic crystals. At the end of the reception, the vases and flowers can be given away as wonderful gifts to special guests or helpers, bridesmaids (or draw names at each table to pick the guest who gets to take the centerpiece home) – the vase will be an elegant piece for them to enjoy in their home that will remind them of your wedding forever. Surprise your fiance on your wedding day. Secretly take a few singing lessons to brush up your singing voice, then at a predetermined moment at your wedding reception, take the microphone and serenade him or her with a song that has special meaning to you both, or one that perfectly captures what you want to express to him / her on your wedding day. Extremely romantic and truly unforgettable! 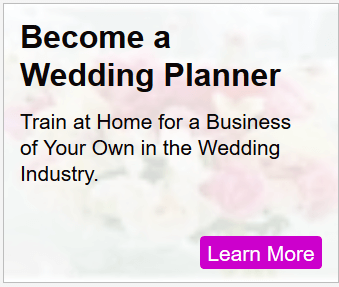 Can’t come up with a unique gift idea for your flower girl? What little girl wouldn’t love a Bridal Barbie? All the magic of your wedding day is certain to capture her imagination & keep her mesmerized. You can bet she’ll spend hours reliving it over and over again in the fantasy world of Barbie. This is one gift that is sure to be both cherished and well used! Searching for inspiring and unique wedding decorating ideas? Go to our wedding decor section! Its packed with pictures! Or check out our unique wedding cake ideas for even more photos and ideas to inspire you! Did you find an idea you liked here? Leave a comment and let us know! What are your unique wedding ideas? Leave a comment to share them with other couples!